On our recent visit to London, catching up on the beer scene was one object, easy to do given lunch, dinner, and the odd reviver at … teatime. We did one excellent pub crawl too with a London friend, focusing mainly on the South Bank. My approach was, I took it as it came: I didn’t seek out places identified in advance, with two exceptions. One was to try the (matchless) unpasteurized Pilsner Urquell at the Draft House in Seething Lane. The other was to taste the beer from the revived Truman’s, a great name in London brewing that stretches back to the 1600s. I like to alight upon a place for better or worse rather than pre-select as it gives me a better idea what the average person encounters. In fact, I had very few bad pints, beers that is out of condition or sour which is always a risk with cask-conditioned beer. On average I encountered fewer duff beers that 30 years ago. The worst were in the City, where sour beer was encountered successively in two places. We had a sourish stout as well in another place where the landlord wouldn’t change it, the first time that ever happened in my years of travelling to the U.K. But it was still drinkable and with the success of sour beers recently, would be regarded as more than acceptable if sold as “sour stout”. This is a lesson in the relativity of palate. I ended up attending a local CAMRA beer festival as well, out in Kingston west of London, an easy commuter ride from Waterloo station. Many beers were “tasters”, or from glasses not finished with an extra cost therefore incurred. I feel it is worth it though, for a number of reasons. I don’t want to drink too much, even on vacation. Also, after a drink or two I can’t really taste the next one – taste that is – so a natural limit is imposed. Truman holds a special place in my affections. To my best recollection, it was the first beer I had in Britain, or if not the first, one of the first. It was the early 1980s, some years before the Truman Black Eagle brewery closed in the East End in 1989. It was not draught beer, but rather a bottled pale ale. I remember clearly where I had it, at a hotel on Berners Street called New Berners Hotel. The place is still there, with another name. Generally I wouldn’t drink in the hotel with the plethora of pubs nearby. Perhaps I just wanted to try a bottled pale ale as against the insipid “light ale” then available in ranks in a metal tray on the backbar. (The tray was a kind of cooler, the term cool used advisedly). Another reason to try the bottled pale may have been I couldn’t find any Truman draught so that was a way to understand the Truman taste. The bottled Truman’s was pitch-perfect, pale ale of the sweetish amber type and aromatic from English hops. It had a blue label similar to that in the vintage coaster above. On later trips before the brewery closed, I never found the beer again, any form. After closure, I had to be satisfied walking past the old brewery on the edge of Brick Lane. It remains there, today, as a busy heritage site housing shops and offices. So when I heard that Truman’s was revived some ten years ago, I decided to try the beer when I could, hence looking for it on this trip. Two entrepreneurs bought the name from its big brewery successor. See this well-written and referenced Wikipedia link for the background, and on the history generally of Truman, Buxton, Hanbury, formerly both of London and (from 1877) Burton-on-Trent. Truman’s was one of the few breweries whose roots predated the porter era, then grew rapidly with the rise of London porter, participated in the pale ale surge of the later 1800s, endured well beyond Allied victory in 1945, but slowly rolled to cessation especially after the lager wave of the 1970s. The new label-owners contract brewed initially but set up a brewery in Hackney Wick (east London) a couple of years later. The original Truman yeast was recovered from a yeast bank and used for some of the beers, including I believe Truman Runner Ale, a 4% abv “session” beer. If you examine the website you will see a range of beers, a dozen or more, made at Hackney Wick. 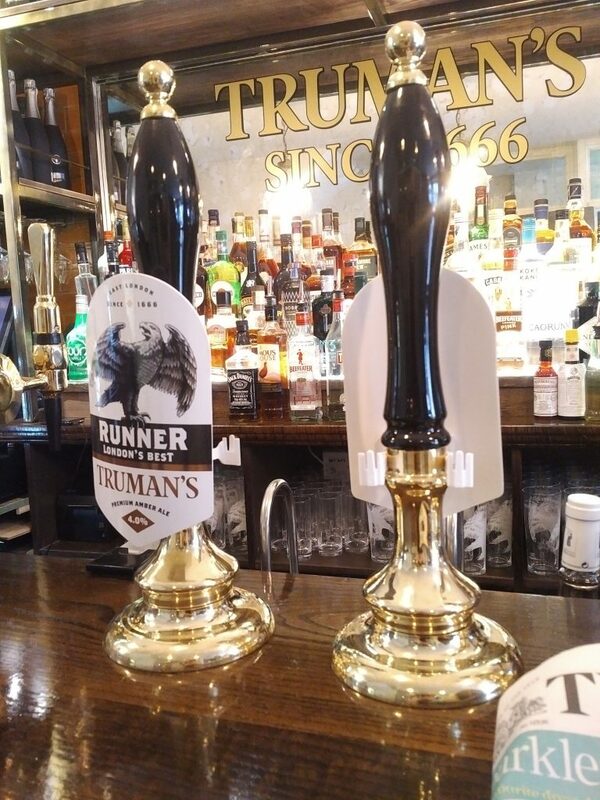 I tried a number of these at the Newman Arms in Fitzrovia, just a hop and skip from Berners Street as it happens, a satisfying connection to my first taste of Truman’s. 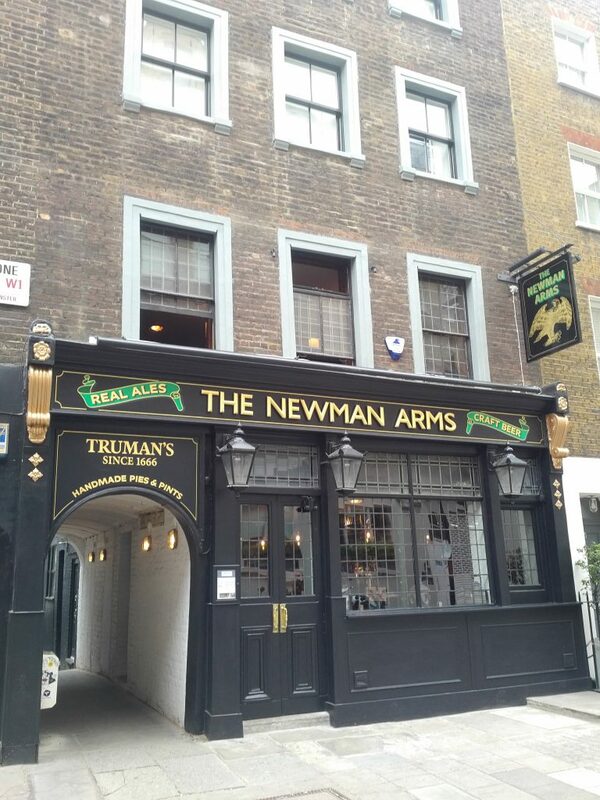 The Newman Arms, 23 Rathbone Street, just re-opened under the Truman banner but existed earlier under the same name, indeed for hundreds of years. The pub is storied and important enough to have its own encyclopedia entry, here. The prior landlord had a tiff with licensing authorities. The newspaper stories linked render the sad tale, almost tragi-comic: in a mediation designed to avoid a full licensing review, the landlord suggested that neighbourhood disturbance could be minimized if the rate of serving beer was slowed down, intending the comment as light humour. The authority apparently misconstrued the statement as it requested the pub to do just that! This meant things like settling full debit payment before taking the next order. Whether for this reason or another, the prior ownership decided to close down. The pub was left dark for a time, and then reopened 10 days ago under the Truman name. A handsome refitting was done, the former white fascia being replaced with a design of gold lettering on glossy black. The main oak bar is the same but to my mind, when you compare images of the old pub to the new, Truman Newman Arms resembles more a bar, an American bar. The ground level is a rather small space but there is a first story and basement level to handle a larger capacity. 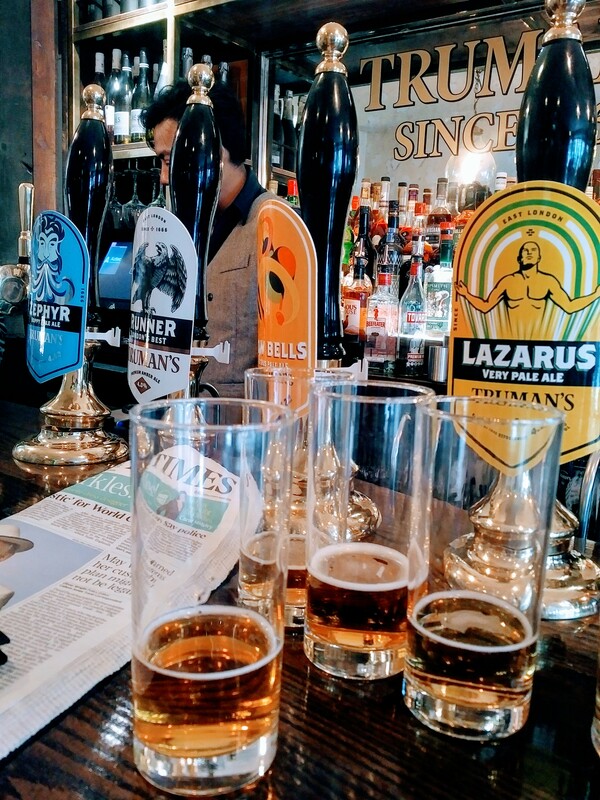 The beer range is excellent, with four or five cask ales from Truman, a number of keg beers (fizzy, chilled beers or stout), and a good range of lagers, one from Truman, the Raw Lager (not tried). I liked the Lazarus Very Pale Ale a lot, which to my mind tastes English despite the website’s mention of New World hops in the composition. Lazarus has a big inviting hop taste and good malty character without the caramel malt signature of much English bitter. It is perhaps a “golden ale” in English terms, but reminded me more of the straw-yellow type of bitter that used to be made in contra-distinction to “best bitter” with its signature of caramel malt. The Runner Ale tasted “dank” to me, like numerous contemporary craft IPAs in North America. It is doubtful this is from the hops as they are classic English type, floral/herbal/woodsy. The house yeast may well explain it though, as 19th century pale ale could have a barnyard scent as I documented in a recent post. Certainly the beer wasn’t off-spec, see e.g. Difford’s Guide, here, whose account is similar to my take. Indeed Difford uses language remarkably similar to J-K Huysman in 1884. One of the ales has a fruit addition, orange and lemons, and will be a great summer beer. It was available both in keg and cask form. I should mention too the house’s cider, from Brittany, on the sweet side, with a taste not dissimilar to cider from the Cox Orange Pippin, superb. With no yeasty haze or wild yeast taste from Brettanomyces, it’s in my wheelhouse. The staff were most congenial and helpful, and I have no doubt this pub will soon regain its former level of trade and neighbourhood character. It’s on a fairly quiet street but with a busy commercial area surrounding. The character of the beers and fame of the Truman name – many still remember it – will surely help. Right now pasties and snacks are being offered and a full menu is being developed as the kitchen ratchets up to full operation. Did the beers I try match to the taste of the bottled pale ale c.1985? Not really, but you can’t reinvent history so literally, it almost never happens. I was very happy simply to sip a Truman’s beer again in London. On the other hand, in regard to the Runner Ale, I’d think there is some real connection to Truman pale ale of 1884. Not the alcohol, which is lower, or the malt grist, which includes some rye and wheat today, but the yeast background. In that sense, what I had perhaps bested the bottled pale ale of 100 years later, in a historical sense that is. Something that has its own reward, for some. 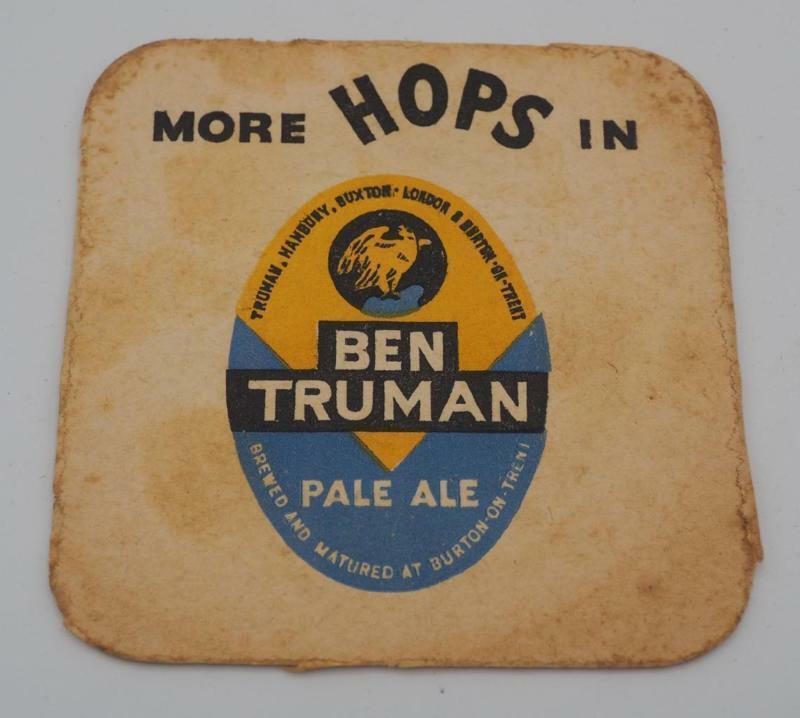 Note re image: the first image shown, a Ben Truman Pale Ale coaster, was sourced from this Ebay listing, here. All intellectual property therein belongs solely to the lawful owner, as applicable. Image used for educational and historical purposes. All feedback welcomed.